Basically it means confirming with a single key stroke the suggestion that Intellisense provides you when you’re typing. And I think it’s much much easier to use than the default behavior, which is to tap an arrow key so you can highlight the suggestion of Intellisense, and then Enter to choose it. The Intellisense suggestion is framed in blue. YES, it’s the right one ! NO, I don’t want to have to select it in the list ! You guessed it right, why can’t I confirm it right away ? 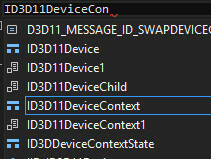 Fortunately, Visual Studio provides a way to tweak this, it’s just hidden deep in the options menu. 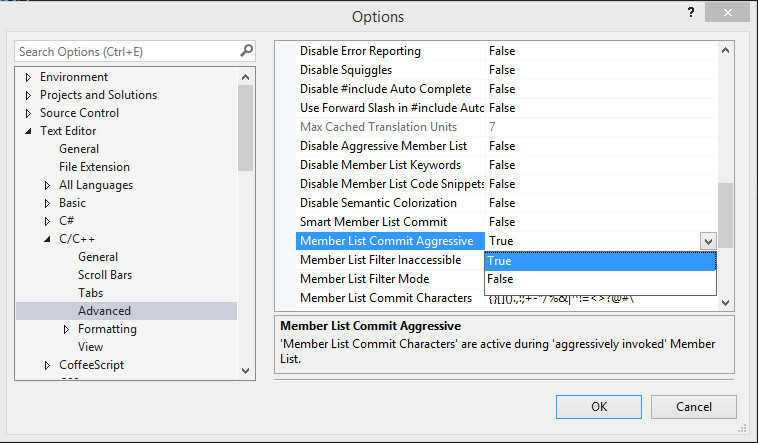 To do this one has to get under Tools -> Text Editor -> C/C++ -> Advanced and in the « Intellisense » tab, set the « Member List Commit Aggressive » flag to « True ». I *think* KISS isn’t the motto of the Visual Studio team. To me it is the best of both worlds: if Intellisense guesses the type right, you can directly hit Enter to auto-complete your type, and if it doesn’t but you see the right type in the suggestions list, you still can navigate it with the arrows keys to select the right one.